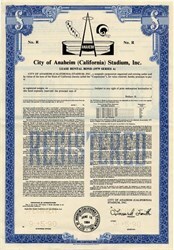 Beautiful engraved RARE specimen certificate from the City of Anaheim (California) Stadium, Inc dated in 1990. This historic document was printed by Security-Columbian Banknote Company and has an ornate border around it with a vignette of the logos of the Anaheim Angels, Los Angeles Rams and Anaheim Stadium. This item has the printed signature of the Company's President is over 28 years old. Angel Stadium of Anaheim (originally Anaheim Stadium and later Edison International Field of Anaheim) is a baseball stadium located in Anaheim, California, and home to the Los Angeles Angels of Anaheim of the American League. The stadium is often referred to by its unofficial nickname The Big A. A train station, servicing Metrolink's Orange County Line and Amtrak's Pacific Surfliner, is located on the north edge of the stadium's parking lot. Angel Stadium has been the home of the Angels since their move from Los Angeles. In 1964, ground was broken for Anaheim Stadium and in 1966, the then California Angels, moved into their new home after having spent four seasons renting Dodger Stadium (referred to during Angels games as Ch�vez Ravine Stadium) from the Dodgers. The stadium was built on a flat land parcel of about 160 acres originally used for agricultural purposes in the southeast portion of Anaheim, near the intersection of three freeways. Honda Center (formerly Arrowhead Pond), home to the Anaheim Ducks National Hockey League franchise, was later built near the stadium. The Angels played their first game at the new stadium, an exhibition game against the San Francisco Giants, on April 9, 1966. They played their first official game on April 19 against the Chicago White Sox. The original seating capacity was 43,204, although about 3,000 bleacher seats were added in the outfield for the 1967 MLB All-Star Game (this was the longest All-Star Game of all time, won by the National League 2-1 in 15 innings on a solo home run by the Cincinnati Reds' Tony Perez). The general shape of the playing field was very similar to their previous home, except for having somewhat less foul territory. The seemingly over-precise dimensions (333 feet instead of 330, for example) were derived from a scientific study conducted by the Angels to try to formulate dimensions that were fairly balanced between pitcher, hitter and average weather conditions. The Angels tinkered with those dimensions several times, expanding or contracting parts of the outfield by a few feet here and there, to try to refine that balance. Angel Stadium, viewed from the Anaheim Amtrak/Metrolink station.None of this seemed to matter to their Hall of Fame pitcher Nolan Ryan, who threw two of his record seven no-hitters in this ballpark, and racked up 2,416 of his 5,714 career strikeouts in a mere eight seasons with the Angels (Ryan stats from The Sporting News Baseball Record Book). Although this stadium was primarily known as a ballpark through the 1970s, it has hosted high school and college football games, National Football League pre-season games, the short-lived World Football League, two crusades by evangelist Billy Graham, and musical concerts featuring such acts as the Rolling Stones, David Bowie, Pink Floyd and Madonna. An urban legend that persists, although it has never been proved, has it that marijuana seeds left on the outfield grass by concert-goers sprouted into full-grown plants which had to be uprooted and destroyed by ground crews. 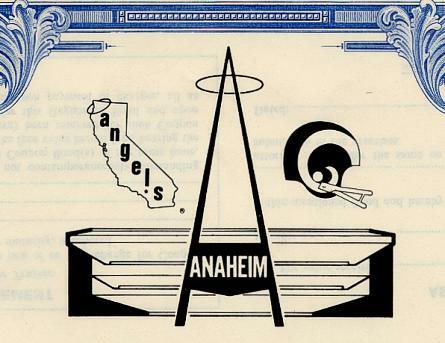 In the late 1970s, Los Angeles Rams owner Carroll Rosenbloom brokered a deal by which the Rams would move from Los Angeles to an expanded Anaheim Stadium. To add more seats (eventually about 23,000) for football games, the stadium was enclosed, with the mezzanine and upper decks extended completely around the playing field. An elevated bank of bleachers was built in right field, and temporary seats were placed underneath, to be pulled out for football games. Another bank of bleachers was built in left field. As a result, the view of the local mountains and State Highway 57 was lost. Additionally, the 23-story, 240-ton Big A scoreboard that had stood in left field, and from whence the nickname for the stadium originated, was moved 1300 feet to the parking lot (it remains today, adjoining the Orange Freeway beyond the right-field stands). A black and white scoreboard/instant replay video board was installed above the newly constructed upper deck seats in left field, but was later deemed inadequate, especially during day games (in 1988 the scoreboard was replaced by a Sony Jumbotron color video board, with black and white matix scoreboards installed above the right field upper deck and the infield upper deck). The expansion was completed in time for the 1980 NFL season, and the Rams played in Anaheim Stadium from then until their move to St. Louis after the 1994 season. The January 17, 1994 Northridge earthquake that was centered in the community of Northridge, in the San Fernando Valley area of the city of Los Angeles, caused the Sony Jumbotron to collapse onto the upper deck seats beneath it. The earthquake occurred in the predawn hours of a national holiday (Martin Luther King, Jr. Day) and the stadium was unoccupied, so nobody was hurt. The monitor was reinstalled directly on the back of the upper deck stands. In 1996, the City of Anaheim and The Walt Disney Company, owner of the Angels at the time (the stadium is located less than three miles east of Disneyland), agreed to a new deal that would keep the Angels in Anaheim until 2031, with an option to leave the facility after the 2016 season. As part of the deal, the stadium would undergo an extensive renovation, returning the stadium to its original role as a baseball-only facility. The section of the stadium behind the outfield wall was demolished, replaced by smaller outfield pavilions and a large water fountain. Disney briefly considered moving the Big A scoreboard to its original location, but decided against such a move, citing costs, as well as the fact that the Big A had become a Southern California landmark in its parking lot location. Despite the fact that much of the stadium was still a hard-hat zone, the demolition and construction being only half-completed, the Angels played their 1997 season in Anaheim. Fans arriving to the newly named Edison Field were greeted to a restored view of the San Gabriel and Santa Ana Mountains, the Brea Hills, and the 57 freeway beyond the outfield. The field dimensions of the renovated stadium became somewhat asymmetrical, with the 8-foot high fence in right center field, which earlier hid a bank of temporary bleachers that were pulled out from under the upper levels for football games, replaced by a 19-foot high wall which contains a scoreboard displaying out-of-town scores of other games. A plaza was built around the perimeter of the stadium, and inside are statues depicting longtime Angel owner and chairman Gene Autry and Michelle Carew, daughter of former Angel Rod Carew (who also played for the Minnesota Twins), who died of leukemia at the age of 17. Angel Stadium during the World Baseball Classic.Replacing the 20,000 seats in the outfield are bleacher seats, a video display board, an out-of-town scoreboard below the right field seats, a "California Spectacular" in which geysers erupt and a stream cascades down a mountainside covered with real trees, artificial rocks behind the left-center field fence, and new bullpens. All of the multicolored seats were replaced by green seats. The exterior of the stadium was also renovated. The concrete structure and ramps were painted a very Southern California combination of green and sandstone. Much of the facade of the stadium was torn down to create more open feeling for visitors. The new main entrance includes two giant Angel hats and a complete-sized brick infield with a regulation pitchers mound. Many families enjoy a game of catch here before entering the ballpark. In 1997, a sponsorship deal was reached with Edison International, giving it the naming rights over the stadium for 20 years, and during this time, the stadium was referred to as the Big Ed. However, after the 2003 season, Edison International exercised its option to exit the sponsorship deal. On December 29, 2003, the Angels announced that from then on the stadium would be known as Angel Stadium (in full, Angel Stadium of Anaheim), although locals still refer to the stadium as Anaheim Stadium, and its original nickname The Big A was restored. Since 1990, Angel Stadium has been hosting Harvest Crusades, which occur every summer, hosted by Pastor Greg Laurie. The field was host to 1967 MLB All-Star Game (the first All-Star Game to be played on prime-time television, although two All-Star Games were played at night during World War II) and again in 1989. It hosted three American League Division Series (2002, 2004, and 2005) and five American League Championship Series (1979, 1982, 1986, 2002, and 2005). Most notably, it hosted the 2002 World Series, which the Angels won in dramatic fashion over the San Francisco Giants, finally winning one for their late and long-time owner, "Singing Cowboy" Gene Autry (and for his widow and business partner Jackie, who is also honorary president of the American League). Famous individual baseball milestones attained here include Mickey Mantle's last game-winning home run, Nolan Ryan's striking out of nine straight Boston Red Sox, Reggie Jackson's 500th career home run and Rod Carew's 3,000th career base hit.